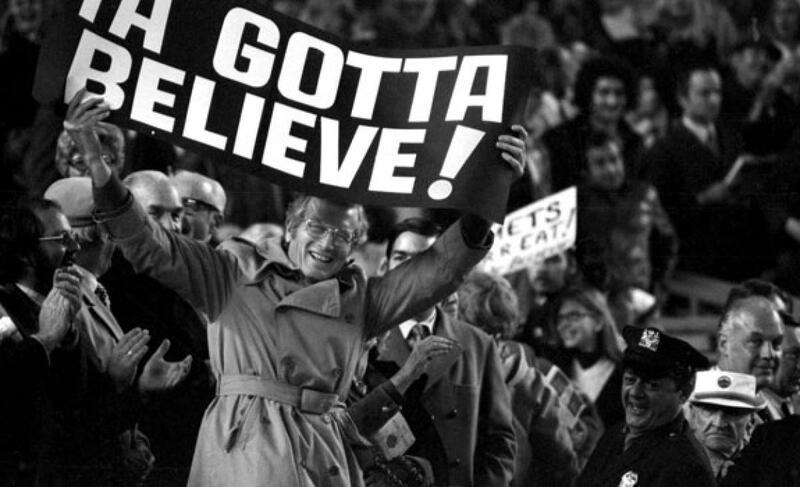 Game Recap: Mets 5, Nationals 3, yet another late comeback | We Gotta Believe! The Mets (78-61) stage yet another late comback and beat the Nationals (71-68) by a score of 5-3. The Mets 2-1 for much of the game against a dominant Stephen Strasburg, but Strasburg allowed a pinch-hit home run to Kelly Johnson, a single to Curtis Granderson, and Drew Storen allowed a 2-run home run to Yoenis Cespedes. After retiring the first two batters, Jacob deGrom allowed a long solo home run to Bryce Harper, his 35th of the year, to put the Nats on top 1-0 early. The Mets countered fast, with a solo home run by Travis d’Arnaud to get even at 1. In the bottom of the 4th inning, Bryce Harper lined a double to right, advanced on a ground out by Anthony Rendon, and scored on a Clint Robinson single. On a single by Ian Desmond, however, Robinson was thrown out at 3rd by Curtis Granderson, with Robinson ever-so-slightly coming off the bag (while David Wright kept the tag applied). DeGrom got Wilson Ramos to fly out to end the threat. It stayed at 2-1 until the 8th inning, with deGrom giving a great performance, but Strasburg doing him one better. From the 3rd inning to the 7th inning, Strasburg struck out 12 out of the 17 Mets he faced. Through the first 7 innings, Strasburg allowed 1 run on 3 hits with 1 walk and 12 strikeouts. DeGrom, through his 7 innings, allowed 2 runs on 5 hits with 2 walks and 9 strikeouts. In the bottom of the 7th inning, Matt den Dekker doubled with two outs against deGrom. Manager Matt Williams declined to pinch hit for Strasburg, opting to let him bat to let him pitch the 8th inning. DeGrom retired Strasburg to end the threat. In the top of the 8th, Terry Collins sent up Kelly Johnson to pinch hit for Wilmer Flores as the first batter of the inning. With a 2-0 count, Johnson hit a long home run to tie the game at two. Strasburg struck out pinch hitter Kirk Nieuwenhuis, but then allowed a single to Curtis Granderson. Strasburg was removed at 103 pitches in favor of Drew Storen. Storen, in a deja-vu matchup, pitched Cespedes up and in for ball one, followed by a hanging curveball that Cespedes crushed to left field to give the Mets a 2-0 lead. Storen retired Daniel Murphy and David Wright to end the inning. In the bottom of the 8th, Tyler Clippard retired the first two batters before allowing a solo home run to Bryce Harper to cut the lead to 4-3. The Mets struck back in the top of the 9th against Jonathan Papelbon though. After a lead-off double by Lucas Duda, Travis d’Arnaud advanced him to 3rd and Michael Conforto singled off the glove of Danny Espinosa to extend the Mets lead to 5-3. Bottom of the 9th, Jeurys Familia looked dominant as he struck out Ian Desmond and Wilson Ramos before getting Matt den Dekker to fly out to end the game. The win puts the Mets 7 games up on Washington with 23 games to play, good for a magic number of 17. The Mets open a 4 game series tomorrow against the Atlanta Braves at Turner Field. Bartolo Colon, reigning NL Player of the Week with a 25 inning scoreless streak, opposes RHP Shelby Miller, who despite a 2.81 ERA, has not received a win in his last 20 starts. WPA Losers: None under -.100. Strasburg gave the Mets’ batters equal opportunity to watch a perfectly placed curveball. Links and Notes: HE BUNTED?